Litang is possibly my favorite small town on Earth. I’ve never been to a place that has so many rough looking people that are so friendly. Litang is the Wild West of Asia. 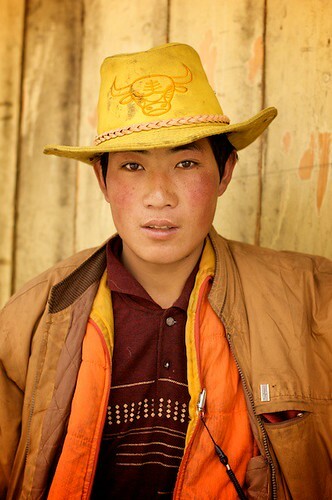 The men dress in a mix of traditional Tibetan clothes and cowboy hats. They’re also known to be some of the best horse riders in Tibet. 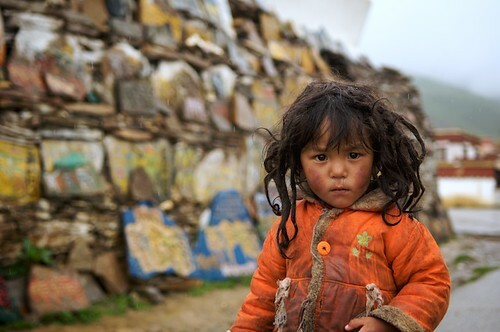 A Tibetan man stops to pose for a portrait in Litang, China. 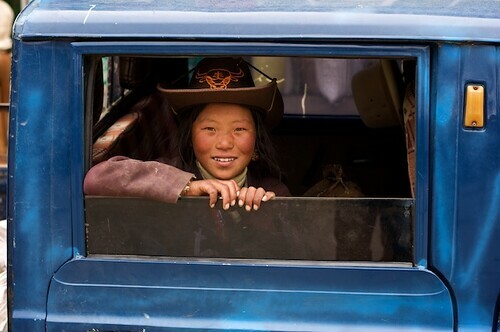 Litang County is well know for it's Tibetan cowboys, and cowgirls. 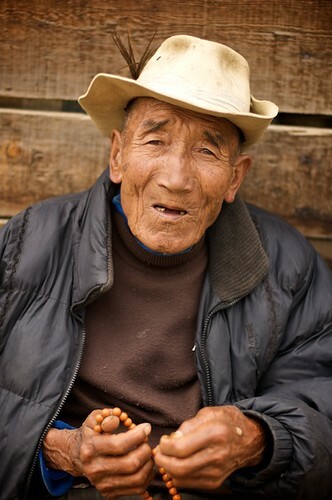 An elderly Tibetan man poses for a portrait while he counts his prayer beads in Litang, China. A funny custom that seems unique to Litang is the decorating of motorcycles. 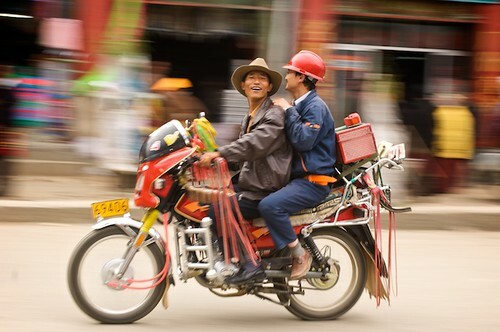 Everyone from cowboys to town-folk to monks decorate their motorcycles to the nines. Streamers, saddle bags, and hand stitched seat covers are the norm. 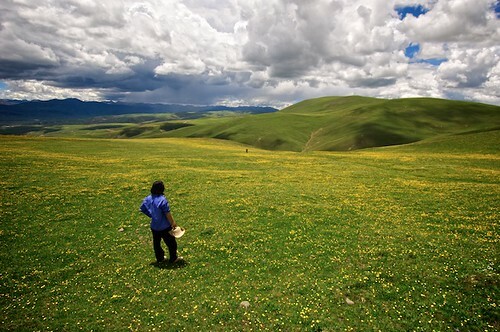 Surrounding Litang are many grass covered, rolling mountains. Each one has a chörten on the top. A chörten is basically a big rock pile that Tibetan Buddhists go to pray and hang prayer flags. Litang’s monastery, Litang Chöde, is set above the town just behind the old town. I spent most of my time in Litang in this area, wandering the dirt roads and meeting locals. As I said before, this is a very friendly town. Rarely would I pass anyone with them smiling or saying hello. Litang's monastery, Litang Chöde, is set above the town just behind the old town. 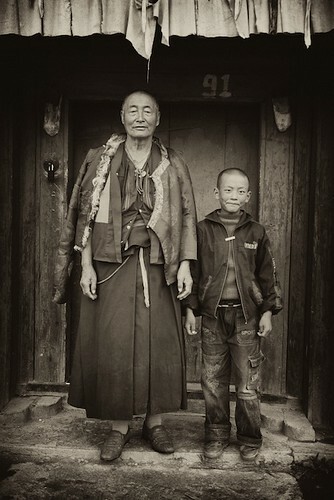 A senior monk and small boy pose in front of their home in Litang, China (Tibet). 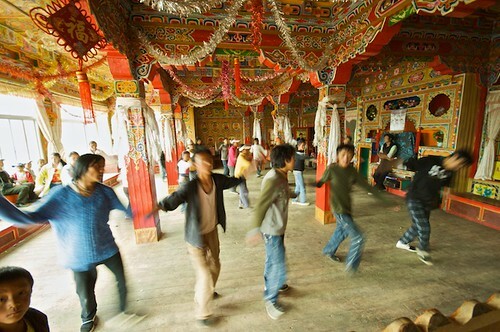 Despite being so remote, Litang teens still keep up with modern Chinese trends. These kids invited me to see them practice for an upcoming dance competition. Rehearsal was in an old unused monastery. Because the people were so friendly, I decided to return two years after my first visit. I wanted to return the pictures that I had taken on the previous trip. It was amazing to find the same people in the same places and to see the children age two years. A fun thing I got to do the last time I was in Litang was visit people that I shot portraits of two years earlier and give them back. It was great seeing everyone age two years, especially the kids. Xiangcheng is an even smaller town about half way between Zhongdian (Shangri-La) and Litang. I highly recommend the bumpy, uncomfortable bus ride from Zhongdian to Litang (or vice-versa). It’s a very rough 2 day ride that overnights in Xiangcheng. But it goes through some of the most remote and beautiful landscape that I’ve ever seen. The beautiful mountains, valleys and small villages will help you to forget the difficult bus ride. When you arrive in Xiangcheng, there will probably be a lady with a sign in English trying to get you to go to her home-stay. Do it! She lives directly behind the bus stop and will treat you to a truly traditional home-cooked Tibetan meal in a truly traditional Tibetan home. 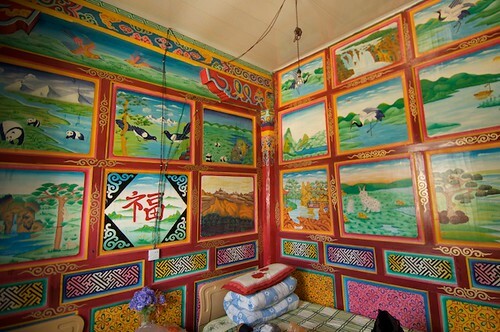 The ornate interior of the Tibetan home-stay directly behind the bus stop in Xiangcheng, China (Tibet). Before you eat, head to the north side of the town to visit the local monastery. As usual, it’s an incredible sight. 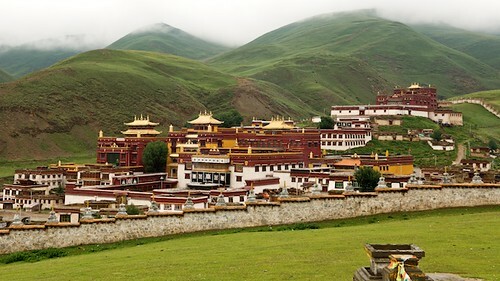 Ornately decorated and populated by very friendly monks, they might ask you to pay a small entrance fee, but they’ll probably also give you a guided tour that includes the entire monastery, including the head lama’s sleeping quarters. 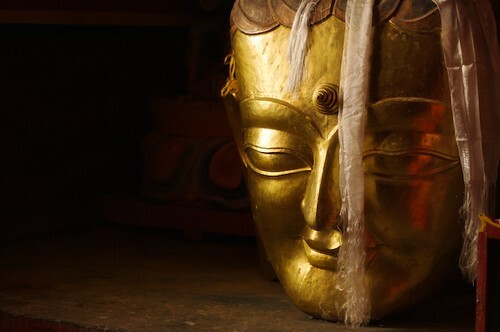 A large carving of Buddha's head sits on a floor in a monastery near XiangCheng, China. If you’re interested in solitude or really finding traditional Tibet, Stay in Xiangcheng an extra day and visit some of the outlying villages. This is really one of the most un-touristed, remote places you’re ever going to find. 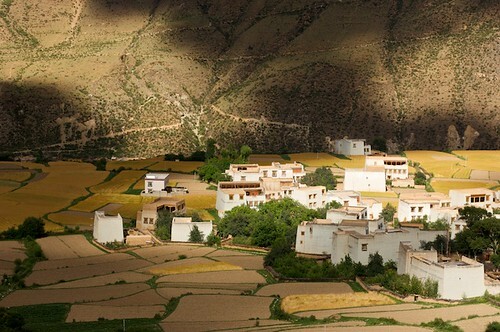 A traditional Tibetan village set among beautiful fields of barley near Xiangcheng, China. This is the second article on my travels to Tibet. The next will be about Tagong and Dawu. The last was about wild Zhongdian (aka ShangriLa). The rest of the articles can be found here. These are gems Neil :) Every single on of them are no less than a masterpiece. Taking the printed copies back after 2 years was very sweet thing to do, love that photo of kids holding their earlier portraits. The last photo is just magical, right out of a water painting. Excellent images. 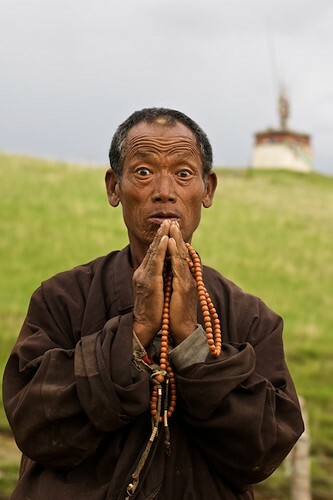 I love the eyes of the praying man in Litang. So expressive. I travelled through Litang and Xiangcheng in 2007, its good to see those places haven’t changed from your photos. I think I stayed in exactly the same room at the homestay in Xiangcheng as the one in your photo. Justin – Actually, these pics are either from 2005 or 2007. 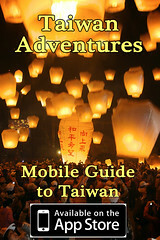 I traveled through this area twice but am just getting around to blogging about it now! Those are some great shots, I especially like the shot of the boy and the older monk. I also like the very first shot, but I don’t understand how you got such a high perspective, was there a nice sized hill you were standing on for that shot? Yeah, it was just a little rocky hill. I actually have a secret method to get a high perspective like this anywhere, but that’s going to have to wait for a future post! Awesome photos! I especially like the little Tibetan kid and wide open plains shot! I have been to Litang before but unfortunately most of my photos got ruined by exposure. I had the traditional film camera back in 2002! Thank you. These are shot with a Nikon D2x. 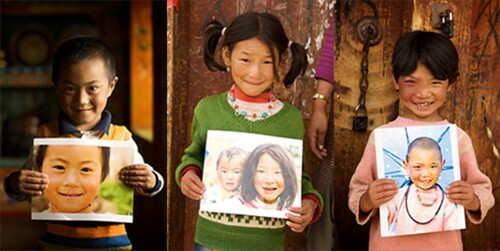 Incredible photographs – I am researching Tibet for a multicultural art project, these are phenomenal. I happened on this from googling. Thank you, Olivia. Let me know if you would like to use any. Hi mate. Fab photos. IN g=fact you have inspired me to go there now. I plan to go in 2 weeks but am not sure about how to get there. From Chengdu or Kunming? I have been to the later so would like to avoid that city. Which way did you travel form? Logistically it could be a nightmare as I only have 1 week there? Appreciate your help! Definitely fly into Chengdu. Hop on a bus to Kanding. I’m not sure how far that is, but I’d guess only a few hours so if you get to Chengdu in the morning, you should be able to get there the same night. From there, it’s a full day’s bus ride to Litang through some unbelievable landscape. Have fun! Post a link on here to some photos when you get back! I’m jealous! It’s really great to see these places again. I travelled there on a whim in 1995, when the Lonely Planet guide advised against the route… I felt as if I was travelling into the domain of magical mountain gods. Arriving in Litang and seeing those amazing horsemen was a real highlight of my travels. I spent 3 months backpacking through China and found many magical spots. Another destination worth considering is Langmusi, on the border of Sichuan and Gansu provinces. It seems that China has no shortage of magical places. It’s good to see that that magic still remains today. Thanks Ana! I just had a look at your site and WOW! You have some great photography! Are you in Slovenia? (If not, sorry!) Wherever you live it looks like a beautiful place! I’ve heard good things about Slovenia, and your photographs make it even more alluring. Perhaps I will try to visit the next time I’m traveling! Thanks again for sharing! Simply stunning photos and experience. I am hoping to do this exact same thing in a few weeks! Might I please ask how you entered and exited Litang? Minibus? Private car? Any details would be so appreciated! Much respect. Both times, I took the 2 day bus from Zhongdian (often called Shangri la now), and stayed overnight in Xiangcheng. It’s an absolutely stunning ride though unbelievable scenery. Then, both times I took a bus from Litang to either Kanding or Xindu. Excellent, that’s just what I want to do. Any chance you remember the price range? Were you able to buy tickets the day of departure? I just remember buying the tickets the day before, or maybe two days before, at the bus station. If you go from Zhongdian to Xiangcheng, be sure to get the ticket for the next day as soon as you arrive. cool thanks, I made it there, it was great!